Stop a stock trade and avoid a catastrophic global financial crash. Seal a microscopic crack and prevent a rocket explosion. Push a button to avert a citywide blackout. Though such situations are mostly fantasies, a new analysis suggests that certain types of extreme events occurring in complex systems – known as dragon king events – can be predicted and prevented. By looking at a simple experimental chaotic system, Gauthier and his co-authors have been able to detect telltale signs that a dragon king event was approaching and, most importantly, stop it from happening. If this work can be generalized to more complex systems, such as climate, power grids, and financial markets, it could be used to forecast and perhaps forestall extreme behavior. The story of this finding begins in the mid-90s when Gauthier was studying the behavior of simple electronic circuits that were trained to follow one another. His team did this by periodically measuring the difference in either the voltage or current between the two circuits. They would use this difference to give one system a tiny kick. The idea was to synchronize the circuits as much as possible. And, for the most part, it worked: One circuit followed the behavior of the other. Chaotic systems are often very simple. They can be characterized by just a few parameters – in this case the voltage and current of the circuit – but they also exhibit random and unpredictable behavior. Yet the voltage and current of the system can’t take on just any value. Instead, the parameters will stay within a somewhat narrow range. 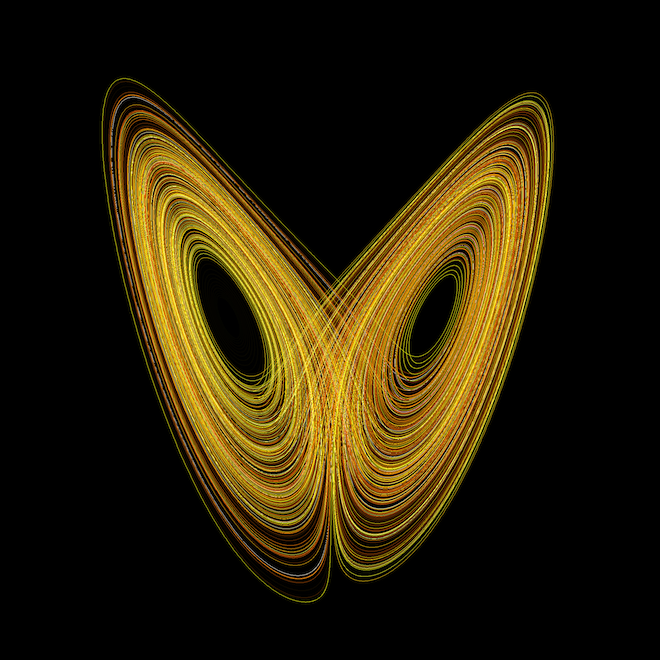 The possible values within this range are what mathematicians call a “strange attractor.” When plotted on an x and y axis, strange attractors often take on odd shapes, sometimes looking like the wings of an arithmetic butterfly. The meeting points of these two wings – the “body” of the butterfly – was where the desynchronization was happening in Gauthier’s circuits. Imagine one circuit is traveling around on a wing of the butterfly, pulling the follower circuit slightly behind it. From time to time, the leader circuit would enter the meeting point of the wings and jump to the opposite side. Usually, the follower circuit would come right along with it but, every so often, the difference between them would be just enough so that the follower circuit wouldn’t make the hop, instead staying on the same wing. And that was it. Gauthier studied these toy circuits, found an interesting behavior, and explained it. At the time, it didn’t seem like a big deal. But in the last few years, scientists in many fields have been looking closely at the behavior of extreme events – very large fluctuations in a system that often leads to catastrophic results. These occur in many complex, chaotic systems: enormous rogue waves in the ocean, extreme weather in the climate, or global stock market crashes. So why dragon kings? Because, like dragons, certain extreme events are entirely outside the normal classification scheme. “Dragons are extraordinary animals of extraordinary properties,” said economist Didier Sornette of the Swiss Federal Institute of Technology Zurich, another co-author of the work. Dragon king events may be freakish, but they are not freakishly rare. In fact they occur much more frequently than you would expect. Small fluctuations in the stock market happen all the time and very large ones rarely. But a dragon-king-type stock market drop would be one that was both extremely large and occurred somewhat regularly. It would be like seeing a once-in-a-century stock market crash every decade or so. But stock markets are complex systems and hard to study. So Gauthier, Sornette, and their collaborators looked at the difference between the parameters of the two circuits in the leader-follower system. Very small differences in the voltage or current were common, as expected. But the extreme “shredding” events when the two circuits were very far apart occurred much more often than would be expected from a normal distribution. They had found one of the most pronounced dragon king event signatures ever seen. 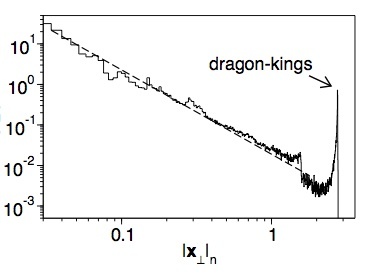 Even more interestingly, the researchers found that dragon king events displayed characteristic signals announcing their approach (they could only occur when the two circuits were on the “body” of the strange attractor butterfly). Knowing that a dragon king was coming, they could apply tiny perturbations to make sure the circuits stayed in sync. In essence, they could forecast the arrival of a catastrophic event and suppress it, prevent it from occurring. By studying this simple circuit system, the scientists hope they might be able to apply some lessons to more complex chaotic systems. Economists, for instance, think some sort of rules might govern the stock market (the rest of us aren’t so sure). If number crunchers could uncover some of these rules and find the warning bells that are correlated with crashes, perhaps they could also be avoided. Of course, that’s been the dream of every trader since the London Stock Exchange first opened up in a coffee shop in 1698. The question is really whether or not the simple circuit-toy model can be applied to a more complicated real-world system. “That is where we’re really taking a leap,” said Gauthier. The leader-follower circuits can be characterized entirely by a few variables. Something like climate or the financial system is composed of significantly more parameters, and no one really knows which ones might be relevant or not. In his work, Sornette has been working to identify what might or might not be useful in predicting the behavior of the stock market. His team keeps tabs on more than 20,000 assets worldwide to try and diagnose bubbles. Using statistical analysis, they search for what he called “trenchant super-exponential growth,” which is where the price of an asset grows much faster than a simple compound interest. It is possible that such behavior is a warning bell for financial bubbles. “We are extremely active in the development of statistical methods to apply to a major outstanding unsolved problem: the financial stability, or instability, of the world,” he said. His research has looked at possible ways to forecast changes in the financial market with some encouraging results. Being able to study dragon king events in an experimental system could be extremely useful, says physicist Cristina Masoller of the Polytechnic University of Catalonia in Spain, who studies extreme events in complex systems but was not involved in the new study. But even if the research may one day help identify precursor signals to dragon king events, there is no guarantee that they can be controlled, added Masoller. “Maybe the parameters that we need to control in order to avoid these extreme events are a parameter we can not change,” she said. Say that oceanic temperature is a relevant parameter in avoiding catastrophic climate changes. Tuning such a variable up and down precisely is likely to be out of human control. Even in something like a financial system, the key parameter may be the amount of money each individual in the world has. Changing something like that might be out of the realm of possibility. In complex systems “it’s possible the laws are simple, but maybe the parameters we need to control are not very accessible,” she said. Gauthier and Sornette are aware of the limitations of their experimental model. But the point of the research was to “at least plant the thought in people’s minds” that it might be possible to predict and prevent dragon king events, said Gauthier. To make that happen, however, scientists would probably have to develop entirely new mathematical tools to identify the key variables in different complex systems, he adds.